Isn’t it interesting how quickly our priorities change when a loved one is sick. I said goodbye to my best friend and companion this week. There have been some small indications here and there that told us she hasn’t been feeling all that well, but mostly she seemed just fine. 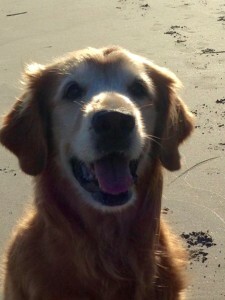 She even had a great run on the beach the night before she became sick. Piper was a birthday gift to me (and my son) in 2003. I have never received a more precious or meaningful gift and I will forever be grateful to the person who gave her to me. In our 12.5 years together, she has comforted, consoled, cheered and entertained me, all the while making me feel like I need to be the best person I can be for her. She was, in so many ways, my soul mate. This amazing dog and faithful companion has been the most unique creature I have ever met, and having her in my life has been one of my greatest pleasures. I never could have imagined that it would be possible to be so in love with an animal, but that is the only way to describe the depth of my feelings for her. I think she knew it, too, because I constantly smothered her with love. I think anyone who knew me had a good idea of special my relationship with her. It’s the little things that really set me off. The missing sounds, mostly. Before, there was always a sound of some sort in the house; Clicking nails on the wood floor, the heavy sigh as she plopped down after following me from room to room, “talking” to me when she wanted my attention, and my favorite – the grumbling as she did her full body “rub” on the couch. In the mornings she would click her way to my side of the bed and lean against the bed with her face near mine for her morning ear scratch. Then she would stand there, thumping her tail on the bed. If she slept a little later than me she would come out of the room with slow, sleepy blinks and a low wagging tail as she slowly came to life and shed the sleepy veil. These are the little things that I miss the most. I don’t even want to think about how much I’ll miss her when I swim in the ocean for the first time in 13 years without her. God, I miss her. 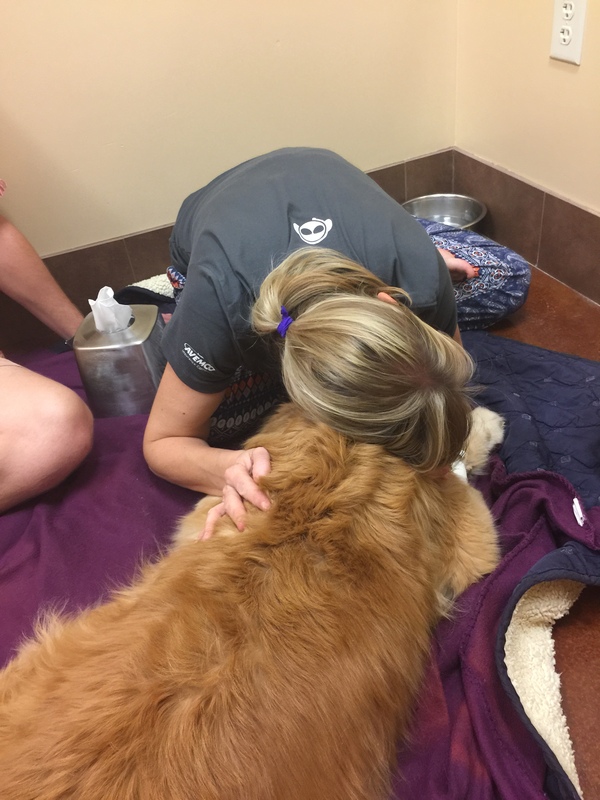 While in the waiting room at the emergency vet I met a woman who was there with her 10yo Golden. She was alone. I cannot imagine going through this alone and I am so glad that my husband Ben was in town for this incredibly sad moment. My son, Justin, was also able to be with us as we gave her a last supper double hamburger and to hold her head in our hands as she drifted to sleep, and then took her last breath. There is a hole in my heart that will never be filled, but will be forever occupied by the memories of our time together. I’m sure it will get easier as time goes on, but I can’t imagine that time yet. Right now, I can barely mention her name without sobbing. Leaving her at the animal hospital felt like leaving my 12yo child, and coming home to an empty house was one of the hardest things I’ve ever done. My house is not a home without her. 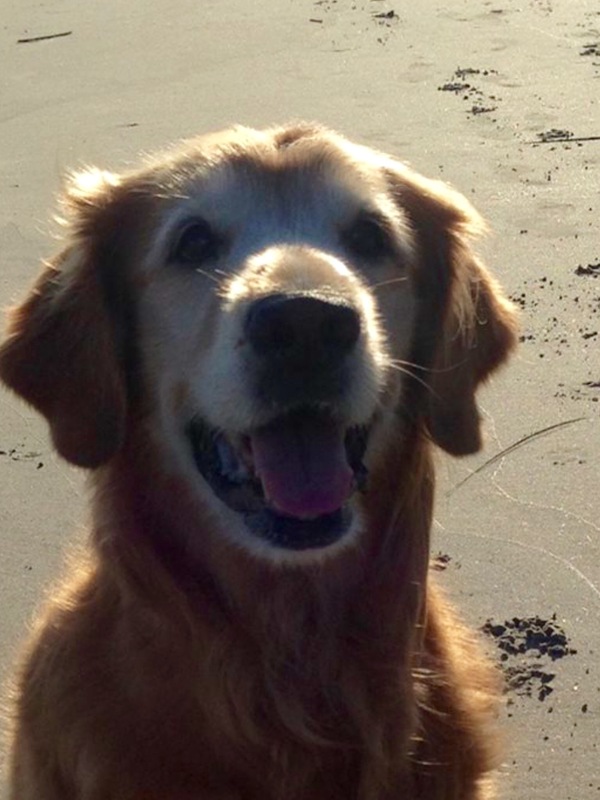 Rest in peace, my precious golden friend. You will not be forgotten.